“Beginning a fitness program is the first step. The next step is reaching out to your community MWR and deciding what fitness programs fit your schedule and your personal preferences,” said Serge Kearse, chief of Sports & Fitness Operations at U.S. Army Garrison Bavaria. 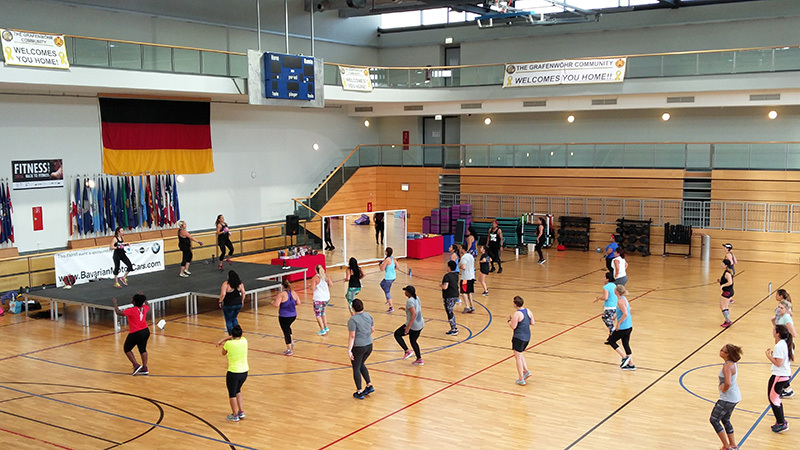 GRAFENWOEHR, Germany — Do I need to start a fitness program? Do I just eat all the right foods? Or do I just simply hire a fitness guru to hold my hand and lead me in the right direction? Let’s start with a fitness program, which is no more than defining your exercise and incorporating a solid nutritional plan. “First when setting your personal fitness goals, and deciding on a plan consider what resources are available in your local area that are low to no cost to you,” said Serge Kearse, chief of Sports & Fitness Operations at U.S. Army Garrison Bavaria. With the launch of the Bavaria Health Initiative in March, many more health opportunities are now available at USAG Bavaria that may have gone unnoticed in the past. The key to a successful outcome is sustainment. Creating a sense of awareness and understanding what steps must be taken are key elements working in concert with the decision to take an active approach to your personal fitness. “Beginning a fitness program is the first step. The next step is reaching out to your community MWR and deciding what fitness programs fit your schedule and your personal preferences,” said Kearse. Next, there is no one more aware of how fit you are than you, but before you start any fitness program you should consult your physician to be fully aware of any health concerns. “It might be a good idea to start with assessing and recording baseline fitness scores. This can give you benchmarks against which to measure your progress,” said Kearse. Be realistic. Although it may be easy to say that you’ll exercise every day, you should have a plan. Start gradually and have each session grow, as you incorporate variety into your routine. “We all may desire different results and may have different outcomes, one single element may not be enough,” Kearse said. “Eating more nutritionally dense foods, like fruits and vegetables, and reducing simple carbohydrates or added sugars, might be another consideration to enhance a healthy lifestyle,” said Sherry Neal, dietitian with United States Army Health Clinic-Grafenwoehr. Personal trainers are also readily available in either Rose Barracks or Tower Barracks Fitness Centers. Motivation from a certified fitness trainer toward a consistent exercise routine is one reason to consider a trainer. Beginning a fitness and nutritional program is an important decision. Understanding the intent of the Bavaria Health Initiative and identifying available resources doesn’t have to be overwhelming. “The focus is on physical fitness, mental well-being, nutrition and sleep. The overall program can be enjoyed by all: novice to the fitness fanatic. It is self-regulated. Scoring/tabulation is done by the participant,” said Michael Mendoza, chief of USAG Bavaria Community Recreation. With this in mind, BHI addresses many facets to a healthy experience. Drinking in moderation is an area covered within the BHI. “The BHI theme is “Be Fit For Life,” said Nicole Tazwell, LMSW, Army substance abuse specialist with the USAG Bavaria Army Substance Abuse Program. ASAP is supporting the BHI campaign by offering the “Decision Making Table Talk,” which allows soldiers to earn up to 50 BHI points. For Soldiers, some points can be used toward promotion. Whether participating in an invigorating spin class or a low impact yoga session, MWR can provide structure while making it fun. Anyone can participate in the overall BHI program and join at any time. Visit the sports and fitness facilities to register and pick up rules and score sheets. For more information about MWR Sports and Fitness, call DSN 476-2650, CIV 09662-83-2650. For more information about the Bavaria Health Initiative, call DSN 475-9024, CIV 09641-83-9024.